The Mesopropithecus is an extinct small to medium-sized lemur from Madagascar. There were 3 species of Mesopropithecus and it is part of the sloth lemur family. The Mesopropithecus was originally scientifically described by Standing in 1905. All 3 species of Mesopropithecus were herbivores. They ate seeds, fruits, and leaves but the proportions of these food items in their diet were different. The Mesopropithecus pithecoides was primarily a leaf eater, while Mesopropithecus globiceps ate primarily fruits and leaves. It also ate more seeds than Mesopropithecus pithecoides. Mesopropithecus was also a mixed leaves and fruit eater, but ate seeds more often. Although the Mesopropithecus was rare, these 3 species were widely distributed across Madagascar island. They also all had different ranges. The Mesopropithecus dolichobrachion lived in the north, the Mesopropithecus pithecoides lived in the west and in the south, while the Mesopropithecus globiceps lived in the centre. Mesopropithecus pithecoides – it was originally described in 1905 and was the 1st species named. It was named because it resembled a monkey. This small to medium-sized lemur weighed about 10 kilograms and had a ratio of limb proportions of 99. Its skull was similar to Mesopropithecus globiceps but it had a broader snout and was more robust. Its skull length was about 98 mm. It shared its range with larger sloth lemurs such as Archaeoindris and Palaeopropithecus maximus. One of the sub-fossil remains belonging to this species was radiocarbon dated to 570 – 679 CE. 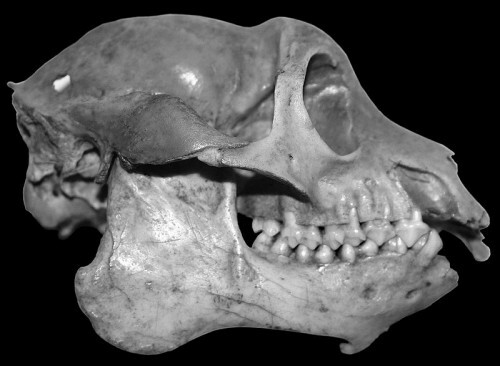 Mesopropithecus globiceps – discovered in 1936 and was originally classified in its own genus, Neopropithecus. It had a prominent forehead and weight 11 kilograms. It had a ratio of limb proportions of 97. It also had a gracile skeleton and narrow snout. Its teeth are similar to modern sifakas. Its skull averaged 94mm long, and its forelimbs were similar to those of living indriids. Samples carbon dated yielded dates of 354 – 60 BCE, 58 – 247 BCE, and 245 – 429 BCE. Mesopropithecus dolichobrachion – first discovered in 1986 but was only scientifically described in 1995. It was found in caves of Ankarana which is in northern Madagascar. This species was long armed and weighed about 14 kg. Its forelimbs were much longer than its hindlimbs, and had more curved finger and toe bones. The skull was about 102 mm long. As the sub-fossil remains are considered to be a modern form of the Malagasy lemur, it is thought that the last subfossil lemur did not become extinct until at least 500 years ago despite carbon dating. The arrival of humans to Madagascar was about 2,000 years ago which sparked a decline in the population of the Mesopropithecus due to hunting and/or the destruction of its habitat.